Give your home or office a beautiful and unique upgrade with tile flooring in Sarasota, FL. At G Fried Flooring America, we carry tile of all shapes, sizes, and materials to meet every customer’s needs. As a robust flooring solution, tile has been a premier choice for centuries and remains a popular option for property owners today. 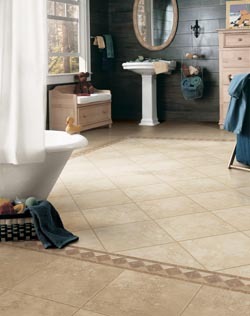 This is thanks to tile being easy to maintain while looking great in any room. Furthermore, because tile is water resistant, it is a superb choice for moisture-rich environments such as kitchens or bathrooms. When you are looking for a flooring solution that is both natural and resilient than tile is the correct choice. From the rugged look of stone and slate tile to the polished sophistication of porcelain and ceramic, there is an option that is right for your property. If you are concerned about the appearance of your new floor diminishing over time, then rest comfortably with a tile surface. Tile surfaces will easily stand up to the comings and goings of your busy property thanks to being both scratch and stain resistant. This resilience ensures that your floors keep their appearance for years to come. Since tile is available in so many colors, shapes, patterns, and materials, the design possibilities for your property are limitless. From the intricately shaped patterns and colors of ceramic tile to the rustic traditional look of stone, your new floorings design is only limited by your imagination. If you are uncertain of what appearance you want or what materials would work best in your space, our team is here to help. Our knowledgeable designers are tile experts and work with you to find the right solutions to improve and upgrade your property. Come into our showroom to discuss your flooring plans with our team, and let us help you explore our vast collection to find the right surfaces for your property. When you invest in new surfaces for your property, it is essential to let our team handle the installation. The task of properly installing tile is intricate work, requiring proper preparation and equipment. All of our installers are trained to handle the surfaces we offer and will ensure that your new floor looks as good in your home as it did in our store. So whether you have chosen to install slate, stone, ceramic, or porcelain tile, trust our team to take care of the work. Contact us when you are looking for new flooring and want to explore our tile options. We proudly serve Sarasota, Longboat Key, Siesta Key, St. Armand’s Key, and Lakewood Ranch, FL, as well as the surrounding areas.